From February 19 to March 1 take advantage of 15% savings + free delivery on Knoll furniture designs by Bertoia, Breuer, Florence Knoll, Mies van der Rohe, Warren Platner, Eero Saarinen, Jens Risom and many other internationally recognized designers. 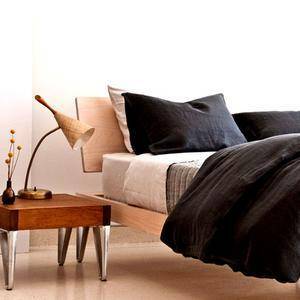 Choose from hundreds of fabrics and finishes to make these pieces fit your home or office. The Knoll Eero Saarinen Collection consists of the Saarinen Table, the Tulip Chair, the Executive Arm Chair and the Womb Chair and many other classic pieces. Eero Saarinen Table pedestal bases await marble tops on the assembly line, 1963. Photograph from the Knoll Archive. The best materials make for lasting designs. A marble tabletop speaks to you. It is smooth and alive to the touch, it is beautiful, subtle, luminous, lasting. Marble being evaluated and marked for cutting by stone masters, 2013. Photography by Knoll. The finished Saarinen Oval Table pairs with Harry Bertoia's Side Chairs - beautiful. New from Knoll is the Saarinen Womb Settee, a classic fit for two! The Saarinen Womb Chair's new double-wide Settee is the perfect modern refuge for the living room, bedroom or office. Available in two base finishes and a very large choice of fabrics. The Knoll Mies van der Rohe Collection consists of the Barcelona Lounge Chair and Couch, the Brno Chair, the Four Seasons Stool and the Krefeld Collection. The Barcelona Chair pairs with a black-on-black Saarinen Oval Coffee Table. A highly curated group leather choices are offered for these classic chairs. Also available in a child's size. 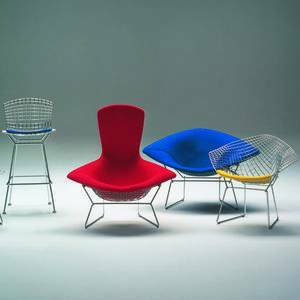 The Knoll Harry Bertoia Collection consists of the Bertoia Side Chair, Barstool, Diamond Chair and the exciting Bird Chair. The graceful Diamond Chair is an astounding study in space, form and function by one of the master sculptors of the last century. The white and black frames are suitable for outdoor use. The Knoll Warren Platner Collection consists of the Platner Arm Chair, Lounge Chair, Coffee Table and the iconic Dining Table. The production process behind the Platner Coffee Table. Photograph from the Knoll Archives. The Planter Dining Table and Chair, designed in 1966, captures the decorative, gentle, graceful shapes that were beginning to infiltrate modern vocabulary. The pieces are created by welding hundreds of curved, nickel-plated steel rods to circular frames, simultaneously serving as structure and ornament. Knoll is now offering the Platner Collection in 18 karat gold. These stunning pieces are all you will need for an elegant mid-century modern room. Call GRShop or Gabriel Ross for pricing details. The Knoll Marcel Breuer Collection consists of the Wassily Chair, the Cesca Chair, the Laccio Side Table and Coffee Table. Like his Wassily and Cesca chairs, Marcel Breuer's Laccio Tables are critical to the story of 20th-century design. Breuer's use of tubular steel to define lines in space revolutionized furniture construction and inspired many subsequent generations of designers. The Florence Knoll Collection consists of her sofas, benches, coffee tables, table desks and her classic credenzas. Consistent with all of her designs, Florence Knoll's Bench has a spare, geometric profile that reflects the rational design approach Florence learned from her mentor, Mies van der Rohe. Have fun choosing fabrics or leathers for this useful bench. As head of the Knoll Planning Unit Florence Knoll saw it as her job to translate the vocabulary and rationale of the modern exterior to the interior space of the corporate office. Always be sure you are buying an original, authentic piece of design. It is worth the investment. No knock-offs please! This entry was posted in Uncategorized, Events & Showcases, Seating & Chairs, Design & Decorating, Accents & Accessories, Living & Rec Room, Fabrics & Textiles, Kitchen & Dining, Office & Workspace, Sales and Promotions and tagged Barcelona Chair, Knoll, platner dining table, knoll classics sale, diamond chair, Knoll Eero Saarinen Collection, Saarinen Oval Table, Saarinen Womb Settee, Saarinen Oval Coffee Table, Knoll Harry Bertoia Collection, Knoll Warren Platner Collection, Marcel Breuer Collection, Marcel Breuer Laccio Table, Florence Knoll Collection, Florence Knoll Bench, Platner table in gold on February 19, 2016 by Christine Toller.